Fantagraphics, 1987. Book. Near Fine. Soft cover. First Ed Thus. Set of 29 oversize paperback eds. All are stated first eds. Published by Fantagraphics between 1987 and 1997. All volumes are in near fine to fine condition with very slight over all wear, the white portions of the covers on Vols. 1 and 8 have yellowed, there is a crease in the front cover of Vol. 31. Set includes Vols 1, 2, 5 through 13 and 15 through 31. . Nostalgia Press, 1978. Very large, heavy book, DJ beneath mylar with color-illustration of Prince Valiant's ship hitting rocks on front, in water at top back with color-illustration of Flash Gordon book advertised at bottom, montage of blue illustrations inside covers and adjacent end papers, beautiful color-illustrations of panels throughout. DJ has very slight surface wear to bottom front tip, very tiny light brown spot at top front edge at middle, slightly browned at spine bottom, tiny nick and two microtears at top back edge, three nicks at bottom back edge. Near Very Good DJ/Very Fine book.. Hard Cover. Fine/Near Very Good. Illus. by Foster, Hal. Folio - over 12" - 15" tall. Nostalgia Press, 1978. Very large, heavy book, DJ beneath mylar, color-illustration of Prince Valiant, sword in hand, approaching Queen at court, on top back in water, illustration at bottom of Flash Gordon book, blue illustrations inside covers and adjacent end papers. Beautiful color panels throughout. DJ has light wear at bottom front tip, very tiny tear at bottom back edge next to tip. Fine DJ/Very Fine book.. Hard Cover. Fine/Fine. Illus. by Foster, Hal. Folio - over 12" - 15" tall. Nostalgia Press, 1974. Book. Good. Hardcover. First Ed Thus. 4 volume set. All volumes first eds. thus. all in Good/Good condition with over all wear to books and dustjackets. Includes the following volumes: In the Days of King Arthur, Companions in Adventure, Queen of the Misty Isles and Adventures in Two Worlds..
Hastings House, 1951. Book. Good. Hardcover. First Ed Thus. Set of 6 illustrated volumes, All first eds. thus. All published by Hastings House, except Three Challenges, which is Nostalgia Press. All in dustjacket, except On The Inland Sea. Good/Good condition, details on condition follows each title below. Includes: Prince Valiant in the Days of King Arthur (1951) - Good/Fair condition, over all wear to book and dustjacket, shelf wear to bottom edge of book, two large chips missing from front cover of dustjacket, wear and crinkles along top and bottom edges of dustjacket, Prince Valiant on the Inland Sea (1953) - Fair condition, wear along top and bottom edge, large stain to front cover, Prince Valiant's Perilous Voyage (1954) Good/Good condition - over all wear to book and dustjacket, price written on front flap of dustjacket, Prince Valiant in the New World (1956) - Very good/Very good condition, moderate over all wear to book and dustjacket, front flap of dustjacket price clipped, Prince Valiant and the Golden Princess (1955) - Good/Good condition, over all wear to book and dustjacket, bottom edges of book shelfworn, large clip from front flap of dustjacket, Prince Valiant and the Three Challenges (1977) - Very good/Very good, moderate over all wear to book and dustjacket..
King Feature Syndicates. Hardcover. 385407008X Please allow 4 - 14 business days for Standard shipping, within the US. Thank you for supporting our small, family-owned business! . Fair. 1980-01-01. King Feature Syndicates, 1983 Bilingual introduction in German and English. Panels in English. Oversized volume. Dust jacket has edge wear, creases, minor scratches, rubbed corners/spine. Boards have edge wear, rubbed corners/spine. No writing. . Hard Cover. Very Good/Very Good. King Feature Syndicates, 1984 Bilingual introduction in German and English. Panels in English. Oversized volume. Dust jacket has edge wear, minor creases, minor scratches, rubbed corners/spine. Boards have edge wear, rubbed corners/spine. No writing. . Hard Cover. Very Good/Very Good. King Feature Syndicates, 1980 Bilingual introduction in German and English. Panels in English. Oversized volume. Dust jacket has a couple small tears/chips, edge wear, creases, minor scratches, rubbed corners/spine. Boards have edge wear, rubbed corners/spine. No writing. . Hard Cover. Very Good/Good. Hastings House. Hardcover. B001NZSFF8 Covers are well foxed. No dust jacket . Good. Seattle, Washington: Fantagraphics, 2018. Hardcover. New/No Jacket. New Graphic Novel: Hard Cover Some shop wear. Fantagraphics Books. Hardcover. 160699588X Special order direct from the distributor . New. Fantagraphics Books. Hardcover. 1606993488 Special order direct from the distributor . New. France: Editons Serg, 1970. Text is in the French language. Book is in very good (top of spine crunched, rear pages and back cover have some moisture damage) condition with a very good (wear at top of spine, moisture damage to rear) unclipped dustjacket protected in a Brodart wrapper. An Attractive Copy! Please feel free to ask me for pictures or more information, Thanks. . Hard Cover. Very Good/Very Good. Fantagraphics Books, 2010-07-20. Hardcover. Good. Fantagraphics Books. Comics & Graphic Novels. New. 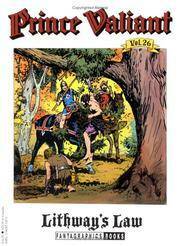 Prince Valiant 17 Brand New: This item is brand new unopened, never used and still in its original manufacturer condition. Fantagraphics Books. Comics & Graphic Novels. New. Prince Valiant Brand New: This item is brand new unopened, never used and still in its original manufacturer condition. Fantagraphics Books. Hardcover. 1606994077 Special order direct from the distributor . New. Fantagraphics Books. Hardcover. 1606994557 Special order direct from the distributor . New. Fantagraphics Books. Fine. 1992. 1st Edition,1st Printing. Large Trade PaperbackIllus. 1560970650 . Fine. Small bunp to the base of the spine,loosened the title page from the spine,else New. Slight discolor along spine of the cover. NO markings. ; 510589; 48 Pades. Folio . Fantagraphics Books. Humour, Fashion & Entertainment. New. Prince Valiant Brand New: This item is brand new unopened, never used and still in its original manufacturer condition. Fantagraphics Books, 2011-03-21. Hardcover. Good. FANTAGRAPHICS BOOKS. GOOD CONDITION. LARGE PAPERBACK. oversized . FANTAGRAPHICS BOOKS. GOOD CONDITION. LARGE PAPERBACK. oversize . Long Beach, CA: Pacific Comics Club. VG. 1978. 1st Edition. Paperback. First edition bound in full color pictorial wrappers. 9 3/4" x 13 1/2" trade paperback is in very good condition. There is a diagonal 3" cre ase and bump at the book's upper right corner. Smaller bump at its low er corner. Soiling to the rear wrapper. Reprints Sunday Comics in colo r. . Nostalgia Press, 1974. Book. Good. Hardcover. First Ed Thus. 1st edition thus. Good/Good condition, moderate overall wear to book and dustjacket, dustjacket is worn at top and bottom edges of spine, dustjacket price-clipped..
Kansas City, MO, U.S.A.: Andrews McMeel Publishing, 2008. First Trade Paperback Printing. Trade Paperback. NEW. Schultz, Mark (illustrator). Brief summary of content available upon request by e-mail. Trendy Books, 1975. Hardcover. Good/No Jacket. The boards are a bit shelf rubbed.No inscriptions.Tightly bound.EK. New York: Treasure Books Copyright 1954. The story of the boy, Val, and how he earned his knighthood and became a Knight of the Round Table. Light rub to brightly colored boards else a fine copy. No previous owner's writing.. Hardcover. Illus. by Foster, Hal. Book. Pacific Comics Club, California, 1978. 64 pp, quarto, coloured comic strips throughout, wrappers rubbed, else very good copy in illustrated, limp wrappers. Long Beach, Ca. : Pacific Comics Club. Very Good. 1979. Paperback. Mild rubbing and wear to spine and edges ; Large Trade Paperback . Fantagraphics Books. As New. 1992. First Edition; First Printing. Large Trade PaperbackIllus. 1560970731 . As New. No defects, no dog eared corners. No names or ANY markings. ; Harold Foster art; 4to ; 45 pages . FANTAGRAPHICS BOOKS. GOOD CONDITION. LARGE PAPERBACK.